One of the weird and troublesome things about political debates is the disconnect between the qualities of showmanship that the format requires, and what such talents reveal about how a candidate would govern. Take Scott Walker. There is surely no better combination of ideological boldness and political calculation available in the race. As Wisconsin governor, he has learned the possibilities of using power to destroy the opposition’s political and economic base, acting as swiftly and shrewdly as possible. Yet on the debate stage, he comes across as mild, even weak. He is not terrible as a debater. Walker’s problem is that the rest of the candidates, with the exception of Jeb Bush, are extremely telegenic, able to condense their beliefs into emphatic soundbites. Bush, like Walker, is not especially bad onstage. 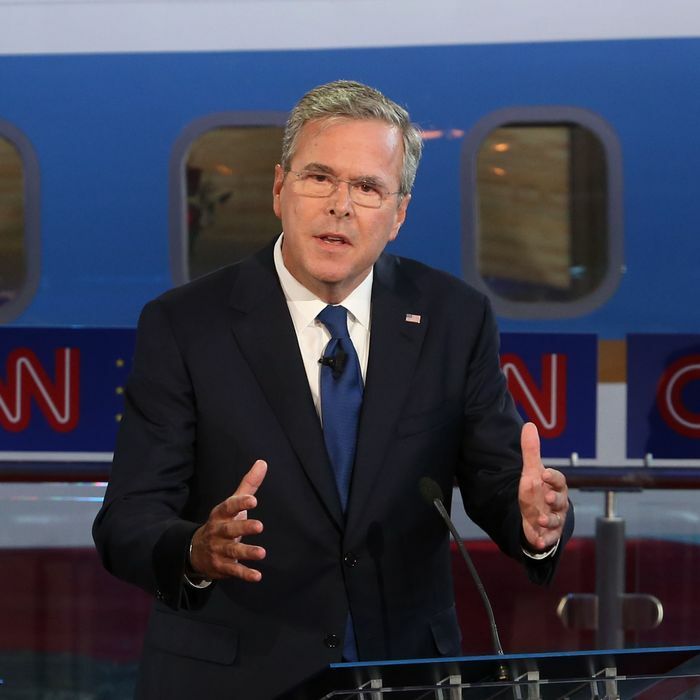 He has the misfortune to go against the perfect Jeb Bush–slayer in Donald Trump. Despite going into the debate with the obvious intention of projecting vigor and dominance, Jeb Bush simply allowed Trump to roll over him. He demanded an apology to his wife, and when Trump refused, Bush gave up. I asked him, he said no. What are you going to do? At one point he shrugged in resignation. The Bush administration proved the most fruitful basis for Jeb to press his larger claim that Trump had defied party orthodoxy. Bush garnered his strongest applause by insisting his brother had “kept us safe,” a triumph he — and fellow Republicans — agreed Obama had squandered. The fact that the most deadly terrorist attack in American history had occurred on Bush’s watch, and not on Obama’s, in no way intruded upon this certainty. The most revealing pair of exchanges came at the end. First, Jake Tapper asked Rubio about former Reagan secretary of State George Shultz’s argument that it would be prudent to take out an insurance policy against the effects of carbon emissions in case scientists are right. The question was designed to cut off every possible escape route. Tapper did not ask Rubio to accept climate science, merely the possibility that it might not be wrong. Nor did he ask him to endorse a specific program. Rubio swatted away the premise of the question, insisting, “We’re not going to destroy our economy.” It was telling that Rubio defined literally any policy response to the theory of anthropogenic global warming as economy-destroying. Tapper then asked Trump about his statements linking vaccine use to autism, a dangerous conspiracy theory that has been conclusively debunked. Trump cited anecdotal evidence to support his crackpot beliefs. Worse, the two doctors on the stage, Ben Carson and Rand Paul, had chances to correct Trump, and both instead gave him tepid support. It is depressing that a presidential field with two doctors cannot even produce sensible views on medicine, let alone anything else. The party’s decades-long flight from empiricism and reason shows no sign of abating. Alas, from Trump to Rubio to Carly Fiorina, it is filled with talented demagogues well suited to pitch America on nonsense.